Bertie is a 3 year old boy living with Batten Disease – a very rare and neurological degenerative condition causing seizures, total lack of mobility, blindness and childhood dementia. This means that Bertie needs full support with day to day tasks, such as washing and bathing. 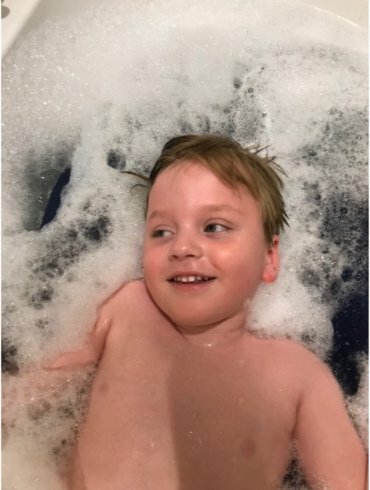 Bertie’s family recently had their house adapted to suit Bertie’s needs and one of the life-changing adaptations was the installation of his Kiva Height-Adjustable Bath. The Kiva is specialist bath; designed, manufactured and installed by Astor-Bannerman, to cater for people with complex needs. Bertie’s bespoke bath gives him and his family the support they require to enjoy bath time together. The Kiva Bath is not only practical, but fits in seamlessly within the family home, designed to look like a typical bath and be usable for the entire family. Bertie’s 5 year old brother is especially keen on their new bath, loving his own bath time and inviting friends over to show off the Kiva’s LED colour changing light system and air spa feature. Mimi was really impressed with the service Astor-Bannerman provided, our expert advisors taking the time to explain to the Disability Grants Officer how the bath worked and how it would make a positive impact on Bertie’s life. She felt that it was great to have a representative making their case and she was touched that Astor-Bannerman had gone the extra mile to help the family.